Erin Bury, advisor and investor in Toronto-based Willful, is jumping with both feet into entrepreneurship, replacing her husband and founder Kevin Oulds as CEO of the company. Focused on end-of-life planning, Willful aims to simplify the process of estate preparation by getting more Canadians to create a will. Bury told BetaKit that she has operated as an “unofficial behind the scenes cheerleader [and] mentor” at Willful since day one, encouraging Oulds to take the initial leap in founding the company in 2017. Since then, Oulds has built a team that has raised less than six figures of friends and family capital, and has expanded into Ontario, BC, and Alberta. During this time, Bury served as managing director of creative communications agency, Eighty-Eight, an advisor and investor to Pressed, and as a board member of Save the Children Canada and Tech4SickKids. Bury was also previously the founding managing editor of BetaKit. Bury said the decision to join was a combination of her looking for the next challenge and Oulds recognizing that the time would eventually come to bring in someone with more experience to scale the business. Bury said that what attracted her to Willful was a market guaranteed to always exist, but also one that had never truly been tapped into from a tech perspective. Oulds got the original idea for the company after the unexpected death of a family member. His family had never made a will, making an already difficult time more challenging for his family. Some near-death experiences for Oulds made him realize that he needed to found a company to encourage people to have a conversation about death, and beginning planning sooner than later. Bury and Oulds had spoken over the last few years about what would happen if she ever wanted to join the company. She said she always joked that she would have to come in as CEO, not only because her strengths lie in business operations and public relations, but also because there was a gap for her sort of skillset at Willful. In his new role as head of business development, Oulds will be focusing on building out Willful’s partnerships with financial institutions, benefits companies, and life insurance companies. He has launched partnerships with the Ontario Teachers Insurance Plan and Honeybee Benefits, with additional partnerships expected to be announced later this year. Oulds told BetaKit that Bury’s business operations experience, combined with her storytelling expertise, will add a great deal of value to the organization, and will allow him to focus on growing the business with partners across Canada. So far, Willful’s strategy has involved partnering with local lawyers in each of their operational provinces to help create the legal content, and answer questions. Bury said she’s hoping to launch Willful across Canada by the end of this year. The company also recently made its first full-time hire to its engineering team, Matt McFadyen, who was previously at Rangle.io. 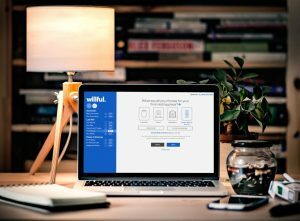 Since launch, Willful has added additional features to its core product, like the ability to designate what happens to pets, and a charitable giving feature, which allows customers to designate a percentage of their estate to a charity of their choosing. 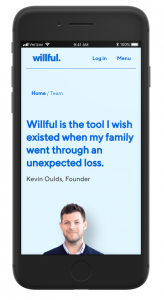 Willful is looking to build out a suite of products that not only help consumers prepare for death through a will, but also through other arrangements that are often overlooked, like wrapping up debt and online and social media accounts. Bury said the company is also developing a hiring roadmap for people in product design and sales, and is expected to announce a series of strategic and affiliate partnerships. Bury added that Willful is in the process of closing its first round of angel financing. The investors are undisclosed for now, but Bury said the company is expecting to raise approximately $500,000 CAD.